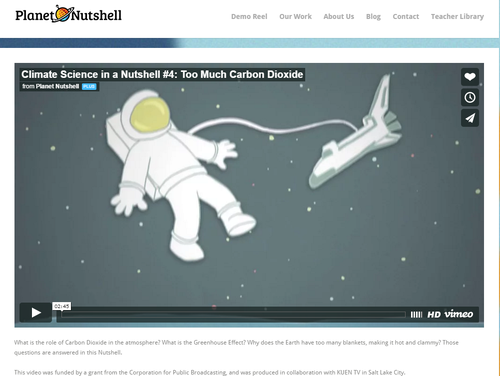 This video is most effectively used in conjunction with the other short videos at [link http://www.planetnutshell.com/climate]. Video makes its points quickly and effectively but lacks the nuance and detail that older audiences would require. Video uses the atmosphere as a blanket analogy (e.g., it shows heat bouncing off the bottom of the atmosphere, suggesting that trapped heat is generated on Earth rather than solar radiation generating the heat and the atmosphere trapping it), which may lead to misconceptions. The instructor should plan to address these misconceptions. The video also shows the atmosphere animated with O2 atoms and nothing else. This is another misconception that the atmosphere is mostly made of oxygen. Students should be made aware of this misconception. Comments from expert scientist: clarity of language and good use of graphics. It is not precise to say that the Sun delivers light and heat. The Sun delivers radiation (short-wave) that is used by the Earth to warm. The Earth emits thermal radiation (long-wave) that is trapped in the atmosphere. Uses an engaging cartoon format. Short and to the point regarding what is causing the greenhouse effect. This is a simplified approach that is suitable for middle school students as long as the misconceptions are addressed. No transcript or teacher's guide is available. The animation style of this video will not suffer if projected in a classroom.